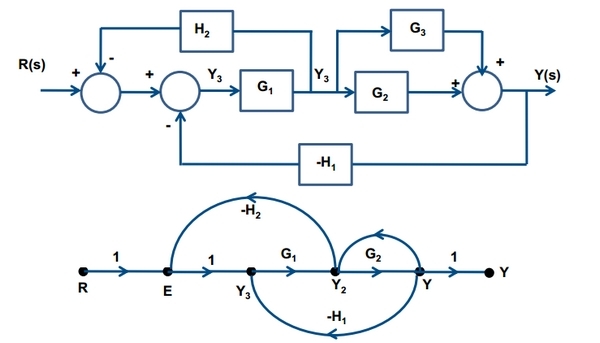 An application for designing, simulating and analyzing the behaviour of LTI (linear time-invariant) systems using Signal Flow Graphs (SFG). The solutions are computed symbolically and parameters can be tweaked in real time. I was annoyed with how hard it is to use Simulink or SciLab's Xcos and how time consuming it is to tweak parameters (requires a "recompile" every time you change something). 1) All outputs update immediately, as you change things. This is achieved by computing the system's state transition matrix and matrix transfer function symbolically whenever the system's structure changes, allowing a very fast re-evaluation of the system's behaviour when tweaking parameters. The application is still in its very early stages. Most of the math has been implemented but is not yet exposed through the UI. This page was last modified on 23 December 2017, at 13:53.